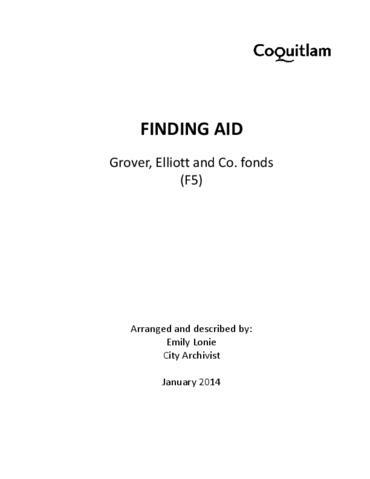 Grover, Elliott & Co. Ltd. was founded on January 2nd, 1974 by three real estate appraisers who took over an existing appraisal office located at 5685 Cambie Street in Vancouver. In June 1985, the company moved to its present offices on West Georgia St. in Vancouver so as to be closer to the Land Titles Office, which facilitated much of their research. The company provides appraisals for all types of real estate including land, multifamily residential, industrial properties, and commercial properties. The records formed part of the real estate appraisal records housed at the Grover, Elliott & Co. Ltd. office until they were transferred to the City of Coquitlam on December 13th, 2012. The fonds has been arranged chronologically by year as per the labeling system employed by the creator.